NASCAR fans have got a fever. And there's only one prescription to cure it. No, with apologies to Blue Oyster Cult, Christopher Walken and fans of NBC's Saturday Night Live, it's not more cowbell. It's something much better. These high-octane injected NASCAR fans are yearning for more short-track racing. And they're screaming loudly. To satisfy this out of control craving, one of the most battle-tested bullrings on the planet stands ready to deliver: iconic Bristol Motor Speedway. Bristol Motor Speedway's recent NASCAR Monster Energy Cup Series races have become fan-approved instant classics. Both Bristol races from the 2018 season rank among the top six of veteran NASCAR reporter Jeff Gluck's popular Twitter-based "Was it a Good Race?" fan poll. The No. 1 race as voted by more than 10,200 fans with a popularity rating of 95-percent, was the Bass Pro Shops NRA Night Race last August. 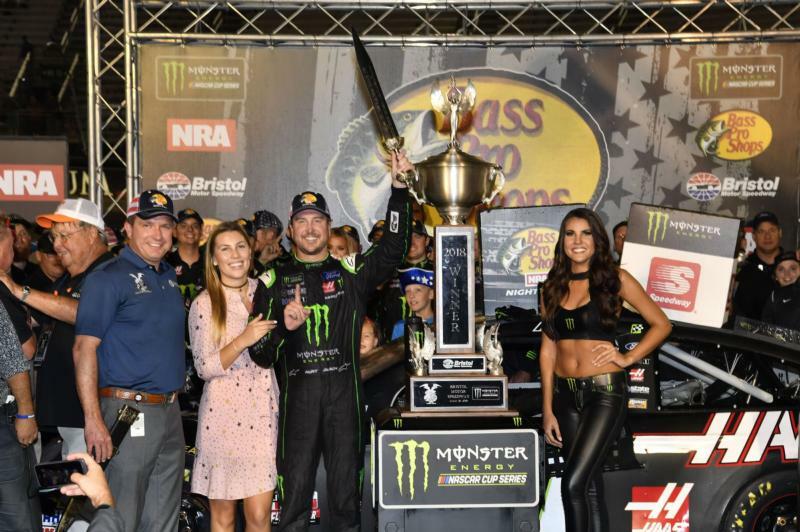 After an amazing duel that featured plenty of plot twists and turns, eventual race winner Kurt Busch raised the traditional Gladiator Sword in Victory Lane and adamantly proclaimed BMS the "Holy Grail of short tracks." Second-place finisher Kyle Larson, drained of energy but managing a huge smile on his face, was such a fan of what had transpired on the track during the race he was passionate when he met with the media post-race and famously said, "Let's build more Bristols." They can choose the high line or the low line. Some even like to stay in the middle. When 40 cars are unleashed when the green flag drops and begin gouging for their tiny portion of real estate and accelerating under full power to grab the lead, that's when the fireworks happen. Just like the edge-of-your-seat closing moments of last April's Food City 500. Kyle Busch took the lead when he gave race-long leader Larson a gentle nudge - the ol' Bristol Bump-n-Run they call it - and powered on to grab the checkered flag. At that point in the season the Food City 500 held the top spot in Gluck's fan poll, but eventually finished the year in the No. 6 spot on the list. The fan-favorite finish continued a streak over the last few years for the Food City 500: The 2017 edition of the race ranked fifth overall in Gluck's poll at the end of the season and in 2016 the race rated ninth overall. So while NASCAR works diligently to add additional short track venues to the Cup Series schedule, fans can always count on Bristol - The World's Fastest Half-Mile - to deliver the close confines, beatin' and bangin' action that their hearts desire so much. In eight weeks, NASCAR fans will have their first chance to catch short track racing at its best during the April 5-7 Food City 500 weekend. In addition to Sunday's Food City 500, the race also will showcase a Saturday doubleheader with the Alsco 300 NASCAR Xfinity Series race and the Zombie Auto 150 NASCAR K&N Pro Series race. On Friday, the Cup Series stars will try to break the BMS track record as they qualify during Bush's Beans Pole Day. In the Food City 500, Defending winner Kyle Busch will be challenged by many of the Monster Energy Cup Series' best, including his brother Kurt, the always-tough Larson, Chase Elliott, Ryan Blaney, Kevin Harvick, Martin Truex Jr., Brad Keselowski, a revitalized Jimmie Johnson who just won The Clash at Daytona, veteran Clint Bowyer, Bubba Wallace and Austin Dillon. Another top challenger for the M&M's No. 18 driver will be defending series champ Joey Logano. A two-time winner of Bristol's Night Race, Logano will be trying to grab a Food City 500 trophy to add to his collection. The driver of the famed yellow No. 22 Pennzoil machine posted top 10 finishes in both Bristol races in 2018. Several new faces have been added to the roster for the Food City 500 as Cup Series rookie drivers in 2019. Those include Daniel Hemric, Ryan Preece and Matt Tifft. Hemric, who has been tough in the Xfinity Series the last three seasons, will drive the No. 8 machine for Richard Childress Racing. Preece, who won the 300-lap Xfinity Series race at BMS last April, will take over the driving duties of the No. 47 JTG Daugherty Racing Chevy. Tifft revealed himself as the newest driver to feature a yellow stripe on his bumper as he will drive a third entry - the No. 36 - for Front Row Motorsports. And for families who want to bring the entire clan, Bristol Motor Speedway officials are making it easier than ever for kids to have an awesome experience. Kids' tickets (12 and under) are free and adult tickets are $10 for Friday's (April 5) Bush's Beans Pole Day. On Saturday (April 6), kids' tickets are free and adult tickets start at $30 for the Alsco 300 NASCAR Xfinity Series race and the Zombie Auto 150 NASCAR K&N Series event. On Sunday (April 7) adult tickets start at $50 for the Food City 500 and kids' tickets are $10. For all races, each child must have a physical ticket in hand to enter the gates. The Bristol Motor Speedway ticket office is the only authorized location that can produce the free kids' tickets.